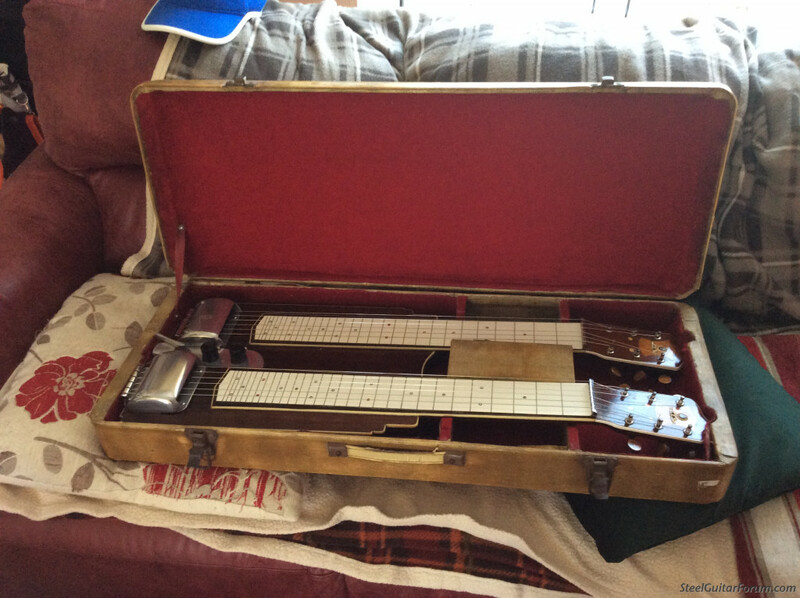 I recently bought this Lap Steel,But have no idea what make it is,it is a stunning instrument sounds amazing but I have no idea as to what make or how old this guitar may be.Any help would be very much appreciated.. It has a D on one headstock,and a G on the other. That's a fascinating looking guitar. I've never seen anything like it here. Since you're in Cornwall England, it's probable that it's made by an English maker. You might post on the Michael Messer forum where lots of knowledgable UK players hang out. 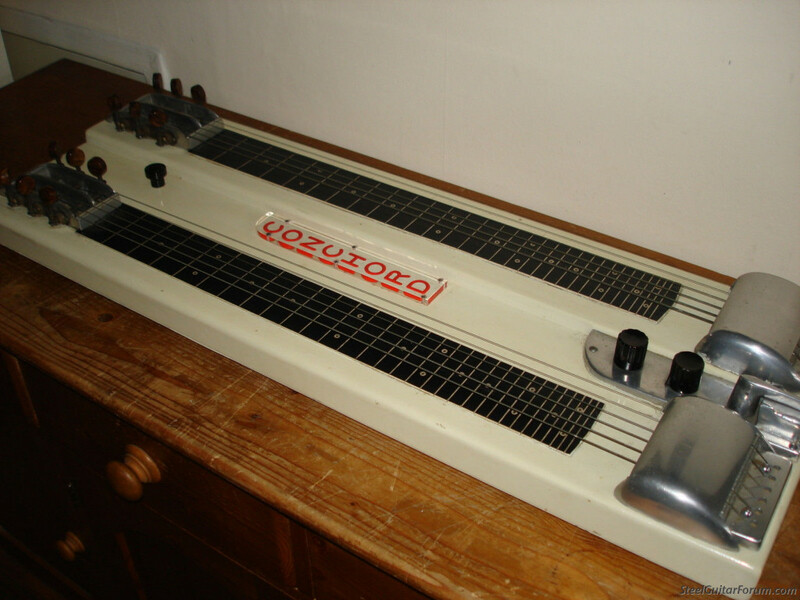 Good luck finding out more about this instrument! D.G. Dog Gone! That's a cool guitar. Any chance of us hearing what she sounds like? 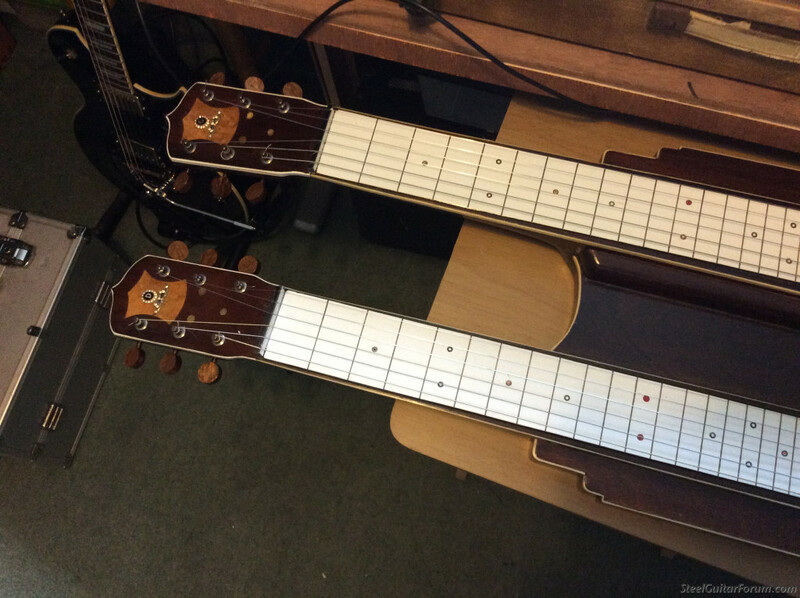 "Gibsonesque" fretboard. 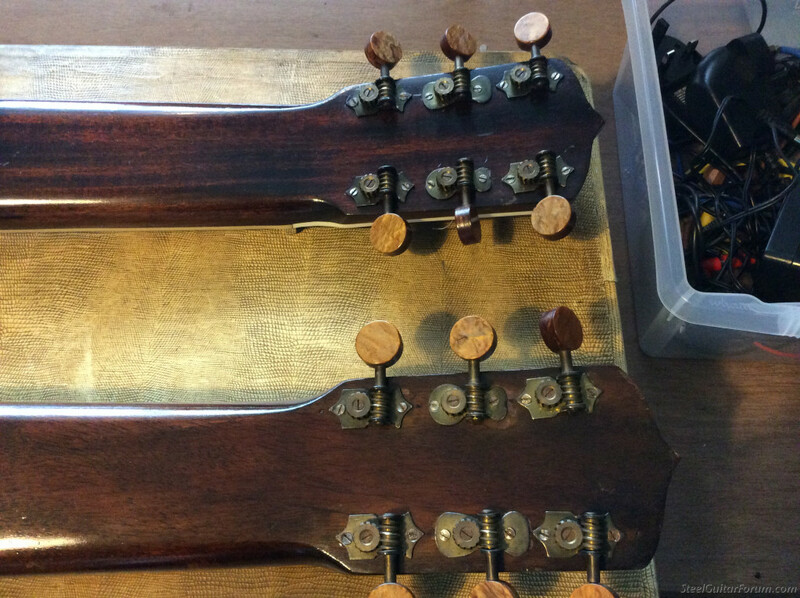 One neck for D tuning and the other for G? After looking at your photos I want to share that I think it's possible your guitar is a UK built branded as " Conchord"
I acquired Conchord a few years back from the UK. 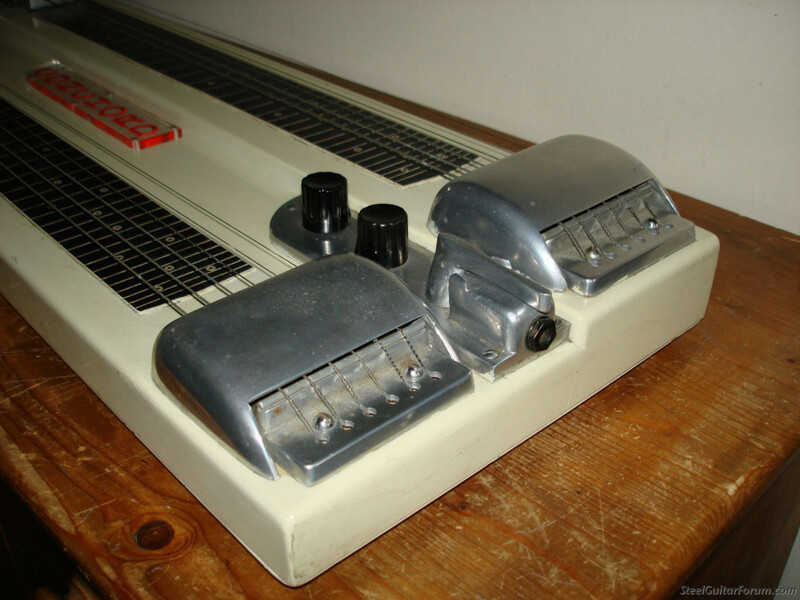 In the attached photos you will see great similarity of the pickup covers and controls. 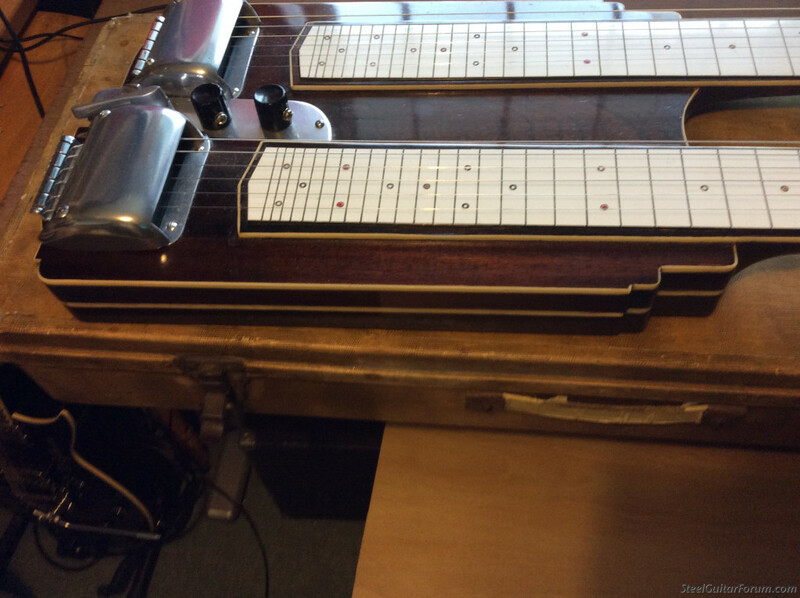 There is some information on-line regarding Conchord steel guitars. Let me know if you see the same similarity. Ding ding! Looks like we have a winner! My guess is mostly Conchord parts on a homemade body. I think Scott may be right. 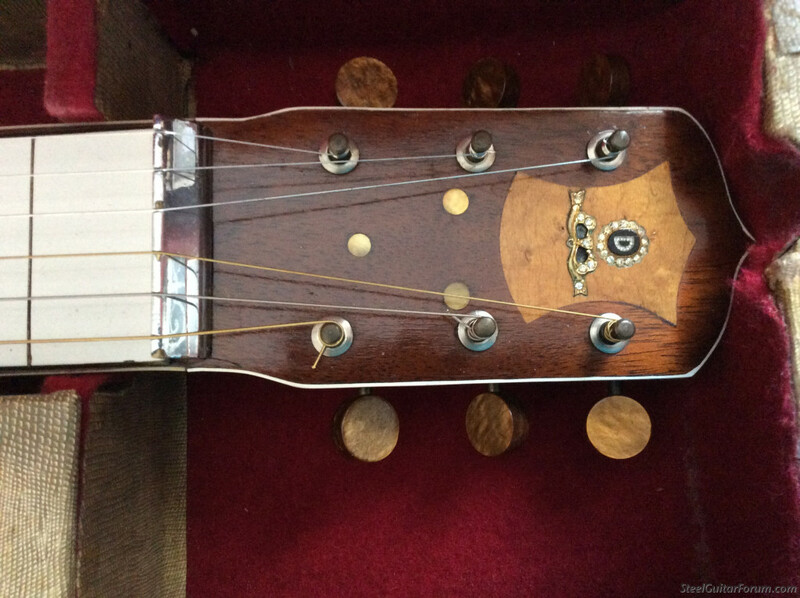 When I look closely at the tuner buttons they are the same unique construction. What is that lever for? Industrial strength pickup selector? I'm wondering what that knob is up by the tuners on Michael's guitar. To facilitate lifting it out of the case? That would make it literally a pick-up knob. The guitar is called a conchord, I wonder if it is some sort or re-tuning mechanism. 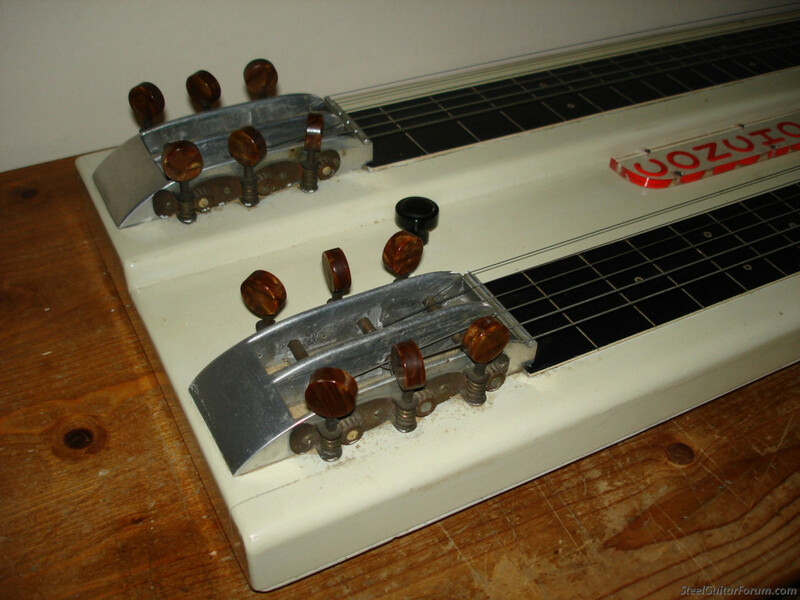 Yes , the lever at the back is a pickup selector. 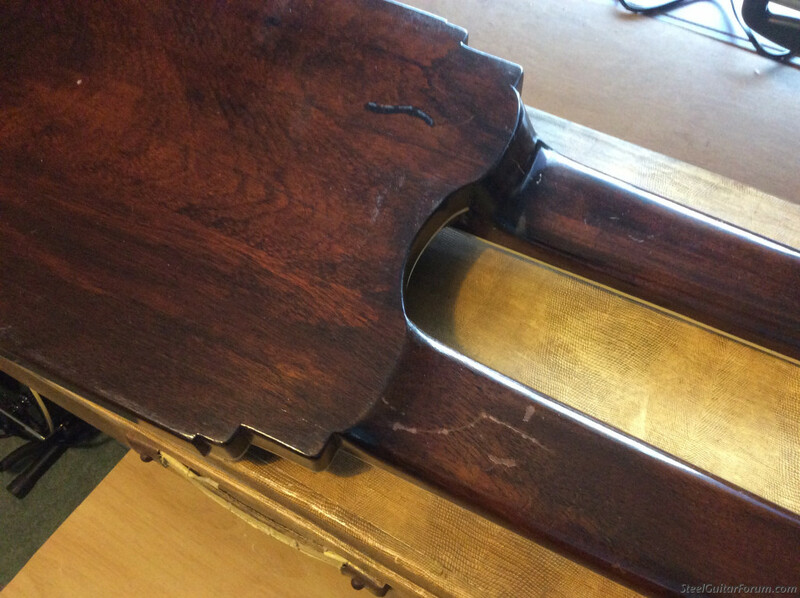 Nice looking double neck with the mahogany Billet and the way it is carved probably done by Conchord themselves as it is a nice job, it is not painted like the other example but it is probably due to the figure of the wood. 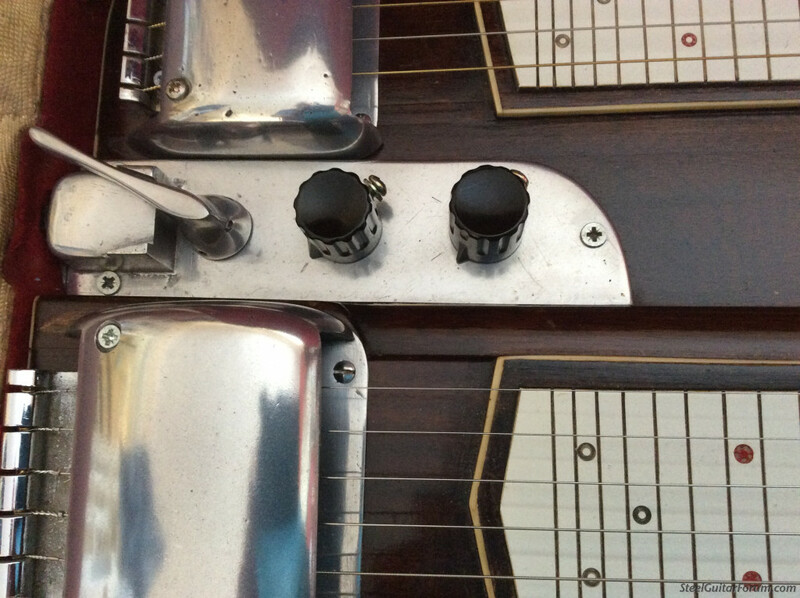 Not only is the aluminium machining for the pickup covers the same but the tuner buttons look the same also. How did you come across it is there any one to ask when and where etc. Will it soon be touring with the Fishermans friends??? Concord is also a famous guitar maker in Kolkata, India. 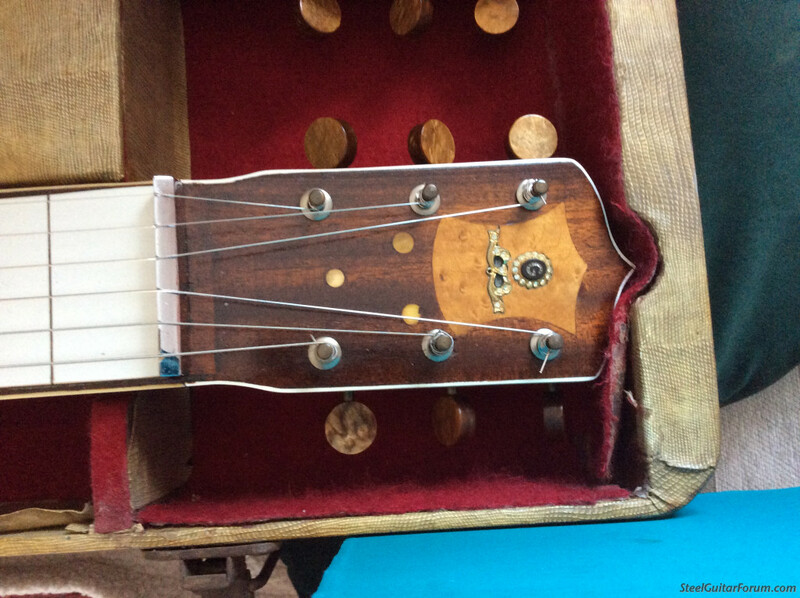 The knob up by the tuning keys on the white Conchord is as you suspected......simply there to assist with lifting guitar out of the case. 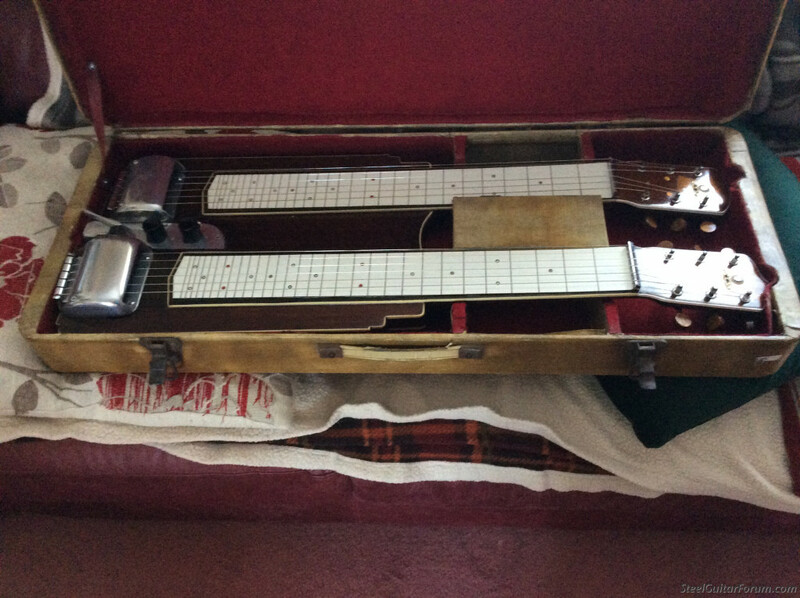 A few years back a steeler from the UK described the Conchord to me as a very popular guitar brand back in the 1950's.......similar to the common Supro brand in North America. Wonder if any of the UK members could comment?